I've already shared a bit about our journey with using essential oils and honestly, I cannot remember a time we weren't using them! They've become such an integral part of our daily rhythm! I'm constantly tweaking and experimenting to find the perfect oils and blends for our family. 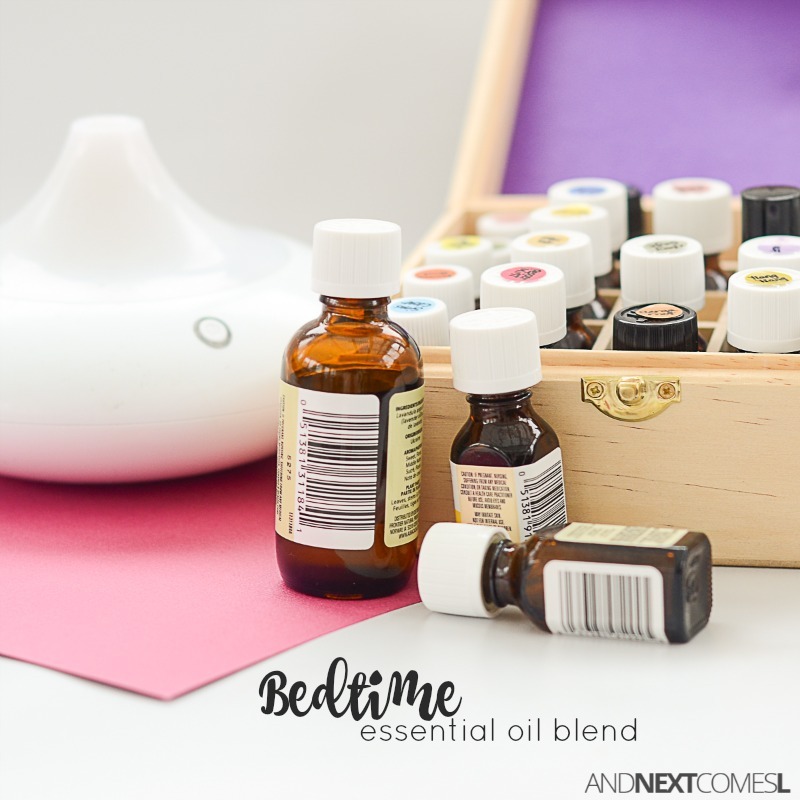 From our weekly detox baths for kids to our calm and focused DIY blend, I cannot live without essential oils at this point. And now that I have perfected the ultimate bedtime blend for kids...well...yeah, what else can I say? 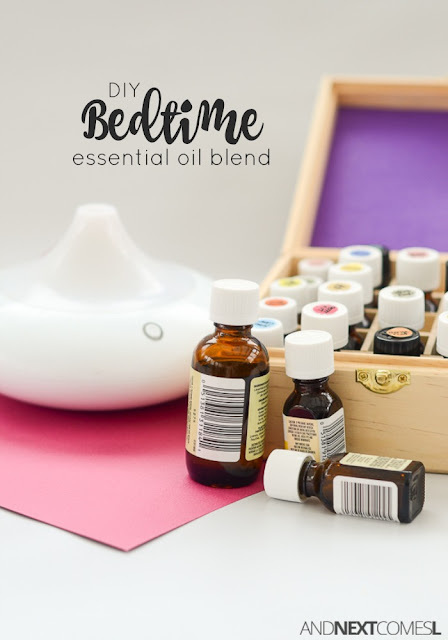 This DIY bedtime essential oil blend is kid-friendly and promotes calm, restful sleep. Simply load up your diffuser with this blend before bedtime and those kiddos will be snoozing in no time! Before using essential oils with your children, please educate yourself on how to use them properly and safely. 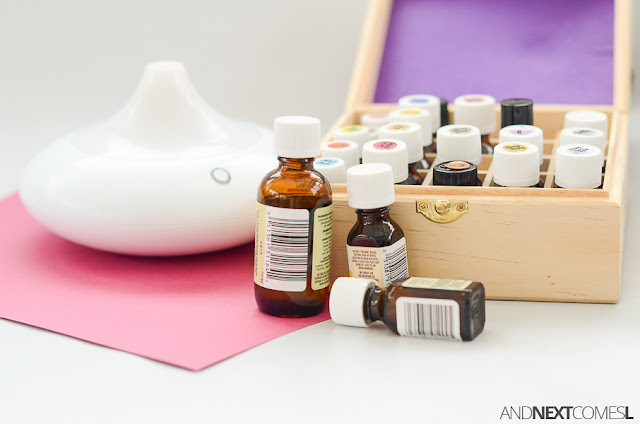 I have outlined some safety tips here, but you can also read my entire beginner's guide to essential oils to learn more. I even tell you what my favorite brand is. And no, it's not one of those overpriced multi-level marketing brands! However, the following essential oil blend uses only oils that are safe to use with small children. I just like to share my disclaimer regardless because so many people dive head on into using essential oils without researching them properly first. I don't want you to be one of those people...just saying. I finally found the perfect bedtime essential oil blend for our family. It smells divine and the kids sleep so soundly! No, it will not make your kids sleep in (I wish! ), but it will certainly help calm and relax your children as they settle down for sleep. We use this blend in our diffuser, but you could certainly try it in a roll-on bottle. You may have to increase the number of drops though. I haven't tried it anywhere beyond the diffuser. Fill the diffuser with water and add the above ingredients. Turn on 20-30 minutes before bedtime. Seriously, this blend of oils is so yummy! I'm addicted to how it smells. We love essential oils in our everyday life, too! I hadn't tried adding the mandarin to our bedtime blend......maybe that's the secret ingredient I'm lacking :)Thanks for the idea. Semi-related, I tried to share this on Co-Promote for you but you're out of reach. Hahaha, yeah I run out of reach all the time on Co-Promote. Let me know how the addition of mandarin works for you! As like me most of the people doesn't know the benefits of using essential oil yet! I first noticed about it from Essential Oil and I am trying to learning more... thanks Dayn for big sharing.